The Long Dark, Hinterland Studio’s wilderness survival romp, received a beefy overhaul this week. Earlier in the year, the studio announced its decision to pause the release of the remaining episodes of its story mode, instead going back to improve the existing episodes with voice acting, rewritten dialogue, additional locations, a new mission structure—there’s a lot. Wintermute Redux is available as a free update now. It was a bold call. 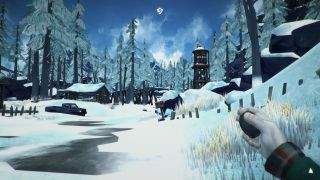 The Long Dark was in Early Access for several years before leaving in 2017 with a complete survival mode and the first two episodes of Wintermute. The third episode was due out this month, so it’s been quite a wait, though it’s received some significant updates in the interim. Take a look at the new trailer. It looks like barely anything has been left untouched, from the narrative and story to tweaked ammunition scarcity. The episodes have been opened up and have a bit more of the survival mode’s sandbox feel, too. And while the main story remains the same, it includes new plot elements and areas. Survival mode has been given some attention, as well. There’s a new craftable item, the wilderness-appropriate rabbitskin hat; a health buff that you can get if you manage to avoid starving for 72 hours, netting you improved condition and carrying capacity; and a new challenge, Archivist, which will task you with collecting memories in Aurora-animated computers. I imagine a lot of developers wish they could go back and give their games another pass, but this sort of thing does make Early Access seem increasingly meaningless. The Long Dark’s development didn’t suddenly stop when it hit an arbitrary version number, it’s still getting game-changing updates and the story isn’t finished—what’s the difference? I’m arguing that Early Access is long overdue a rethink, not that developers shouldn’t fiddle with their games for as long as they like. I’m all for director’s cuts and definitive editions that don’t just repackage the game with a bunch of DLC. I wasn’t planning on going back to Wintermute, but I’ve changed my mind. Check out the patch notes here.